Bread salads are born of frugality. Slightly stale bread loafs and flat breads need never go to waste; they are the ideal sop when resurrected in vinaigrettes and dressings, ensuring not a crumb goes to waste. Much-loved Tuscan panzanellas come to mind, which traditionally include chunks of stale bread, tomatoes, cucumbers and onions tossed in a vinaigrette of olive oil, vinegar and basil. Other ingredients may include anchovy, salad greens, artichoke hearts, bacon, capers or hard-cooked eggs. I’ve also tossed roasted chicken, salmon or chickpeas into these salads. Traditional panzanella aficionados may disapprove of this creative license, but in the spirit of frugality, I let leftovers and pantry staples dictate the ingredients of leftover bread salads. 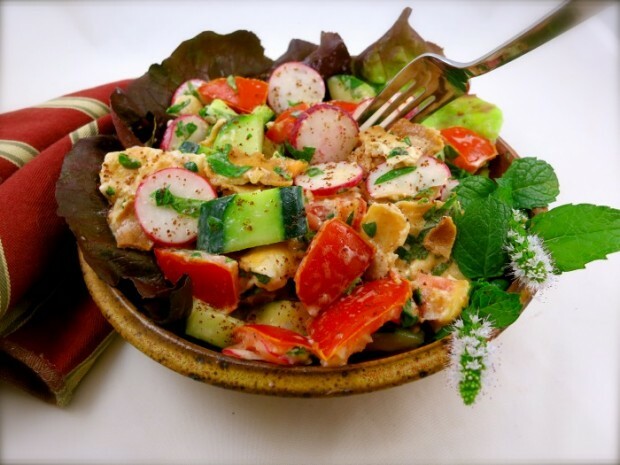 Fattoush or fatteh is the Middle-East response to panzanellas. According to Wikipedia, Fatteh is a Damascas dish that uses flatbread as a foundation upon which various ingredients are added. Their version of bread salads are typically made with stale, fried or baked pieces of pita (flat bread), vegetables and a vinaigrette. I found the following recipe in the September (2012) issue of Food and Wine Magazine. According to its author, Yotam Ottolenghi, everyone in Jerusalem eats chopped vegetable salads with whatever else they are having. It’s unlike most Fattoush I’ve made in the past as it incorporates buttermilk, which gives it a rich flavor. The buttermilk does, however, mute the vibrant colors of the salad. I enjoyed the deviation, but omit if you prefer. Sumac is an ingredient in this recipe you may not be familiar with. It’s a spice commonly used in the Middle East, and its lemony taste plays an integral role in this cuisine. I sprinkle it over many dishes, such as lamb and hummus, or whenever I desire a tangy flavor. Mr. Ottolenghi is the co-author, with Sami Tamimi, of “Jerusalem: A Cookbook,” which is a collection of recipes from their Muslim, Christian and Jewish communities. The cookbook highlights the similarities of the food found in all cultures. It gladdens my soul to be reminded of how food can bring disparate, warring cultures together — even if only for the breaking of bread. The following recipe was adapted from the Food and Wine, September 2012 issue. I doubled the amount of pita, used less vinegar and omitted the dry mint, increasing the amount of fresh mint used in the recipe. A juicy roast chicken would be a marvelous accompaniment. In a large bowl, whisk olive oil, garlic, lemon juice and vinegar together. Toss the radishes, cucumbers, tomatoes, scallions, parsley, mint and pita into the dressing. Let stand 5 to 10 minutes. Add the buttermilk and toss again. Season to taste with kosher salt and freshly ground pepper. 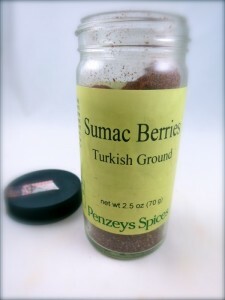 Sprinkle with the sumac and serve.